George Thomas Naunton - Coal Merchant and Fancy Goods Dealer.(K1896). The premises is essentially residential at this time and Naunton's trading activities probably take place in his front room. The corner shop unit does not yet exist. Herbert S Baker - Dealer in Antiques, Walter Joseph Porter, Watchmaker and Marian Brashier, 'Marian's' Art and Needlework Depot (K1908). It appears that all three share the premises. 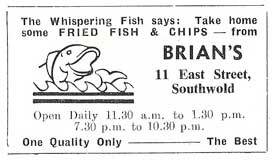 Miss Brashier (whose address is given as 11a, trades in Southwold for many years, not only here but also at 29 Station Road and at Nos 73 and 83 High Street. Arthur Ladd - Fishmonger (K1916). 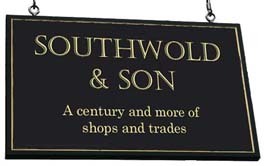 He is the first occupant of the purpose-built, single-storey retail extension unit which he built on the corner of East Street and Pinkneys Lane. Originally No 11 comprised the pink building. 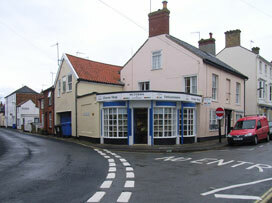 The corner shop unit (now Nutters delicatessen) was built as a wet fish shop in the early years of the 20th Century and has since served a wide variety of purposes. 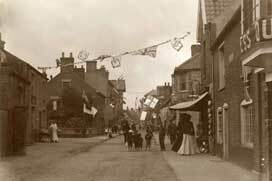 View in 1897 during Queen Victoria's Diamond Jubilee celebrations, looking towards the Market Place from outside the Lord Nelson on the right. No 11 is the chimneyed gable end on the left with a small garden where the single-storey shop now is. 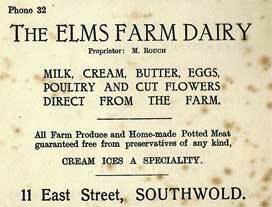 Above: two advertisements for Martin Rouch's Elms Farm Dairy. Top, undated in Southwold Town Guide and, below, in Southwold Wesleyan Church Guide 1929.